Summer Bible School, sometimes called Vacation Bible School, an auxiliary teaching agency of the Sunday school, operated for 2-4 weeks in the early part of the summer vacation period largely for children of grade-school age, but often including at least the first two years of the high-school age and kindergarten, that is, the age range of 5-16 years. Except for scattered single schools of mixed character the first true summer Bible school was conducted in New York City in 1898, while the first fully organized summer religious day school in which the graded children's school was the main feature was held at Ripon, Wisconsin, in 1908. The Presbyterian Church was the first to promote the vacation Bible school on a church-wide basis through its Board of Home Missions in 1910. In 1911 the Daily Vacation Bible School Association was established to promote such schools in the USA. In 1915 the Northern Baptist Convention became the second denomination to promote the DVBS on a nationwide basis, soon followed by many other Protestant denominations. In 1912 A. L. Lathem, pastor of the First Presbyterian Church at Chester, PA, in protest against the nonreligious recreation and manual work features of the Daily Vacation Bible School, started an all-Bible school which he named Summer Bible School. His pattern was followed increasingly by the more conservative evangelical groups. The first strictly Mennonite summer Bible school was started in 1923 by Dean Noah Oyer of Hesston College, Hesston, KS, although Edwin Weaver had conducted a community vacation Bible school in 1922 at Wakarusa, IN. In 1924 the Prairie Street Mennonite Church at Elkhart started its school. By 1926 there were four such schools in the Mennonite Church, including one at Portland, OR, and one at Scottdale, PA, the latter promoted by C. F. Yake, who soon became the outstanding promoter of the cause in the church, and the writer or editor of the earliest summer Bible school manuals. By 1933 there were 40 schools in the Mennonite Church. The Mennonite school, though using the Lathem name, was somewhat different in type from it. The need for curriculum materials was sensed from the very beginning. Outlines of courses used by various schools were published in the Christian monitor in the early years of the movement. However, to provide a standardized guide, the General Sunday School Committee appointed a summer Bible school subcommittee which prepared a manual of summer Bible school courses, published by the Mennonite Publishing House at Scottdale in 1928. The committee was composed of Noah Oyer chairman, C. F. Yake editor, and Paul Erb. The manual contained instructions for organizing and conducting a summer Bible school, and provided ten three-week outlines from Kindergarten I and II to Grade 8. It was designated Departmental graded all-Bible course, providing ten years' work. To meet a growing demand, a committee was authorized in 1931 to prepare teachers' manuals, which were published in 1934. This course was designated A departmental graded summer Bible school course. It provided lesson materials for summer Bible schools of three weeks' duration for two preschool ages and eight grades. With the publication of teachers' manuals and promotional work done through the Secretary of Summer Bible Schools of the Mennonite Commission for Christian Education, interest in summer Bible school increased, so that by 1938 there were 150 schools. The first Mennonite summer Bible school conference was held at the Masontown Mennonite Church, May 18-19, 1933, promoted chiefly by the Southwestern Pennsylvania District Conference; nevertheless it was also general because of churchwide attendance. A general Mennonite Summer Bible School Conference followed, held at the Nappanee Mennonite Church, IN, May 24-25, 1934. A second one was held at the Metamora Mennonite Church IL, June 13-14, 1935; a third at Martinsburg, Pa., May 7-8, 1936; and a fourth at Elida, Ohio, June 10-11, 1937. From these conferences church-wide interest was created; district conferences, institutes, and workshops were regularly conducted into the 1950s. Many of the district conferences in the 1950s had summer Bible school secretaries, and those conferences which did not, had this office included in the Sunday-school secretaryship for the promotion of summer Bible schools. An entirely new course, called the Herald summer Bible school series, was then prepared with graded materials for thirteen years of Bible school: one nursery, two kindergarten courses, courses for eight grades, and a course each for grades nine and ten. Approximately a dozen writers and artists and an editor were employed to produce these materials which, after their publication in 1947, become widely used throughout the evangelical Protestant churches of America. Writers were Katherine Royer, Mary Royer, Ida Bontrager, Elizabeth Showalter, Clarence Fretz, and Russell Krabill; the editor was C. F. Yake. The materials were Bible-centered and experience-related. A teacher's manual with a pupil's workbook and supplemental teaching materials are all integral parts of the materials for each course. The work was all done under the Curriculum Committee of the Mennonite Commission for Christian Education, led by Paul Mininger, chairman. The use of these materials had a most beneficial effect upon the Mennonite Church (MC). Since the publication of these new materials, summer Bible schools increased steadily. In 1940 there were 214 schools with 2,086 teachers and an enrollment of 26,635; in 1945, 300 schools with 2,519 teachers and an enrollment of 28,977; in 1954, 722 schools with 7,703 teachers and an enrollment of 84,157. This was the high point, the next three years showing a slight decline. More than two thirds of the editions of these Scottdale materials were sold to churches other than Mennonite, and more than twice as many pupils from non-Mennonite homes as from Mennonite homes were reached yearly. This does not include the outreach in foreign lands. In 1958 a corps of workers was busy in Basel, Switzerland, translating the courses and preparing materials in German and French, and promoting summer Bible camps throughout Europe. This was carried on through the Agape-Verlag created in 1955 as a European agency of the Scottdale publishing house, with co-operation and support from the Mennonite Central Committee. Most of the courses have been translated into Spanish at Scottdale, and were sold in Puerto Rico and Latin-American countries. One of the most interesting aspects of the summer Bible school movement was the missionary education given to the children. Each year the summer Bible school children contributed for missions and relief work more than one third of the total cost of operating all summer Bible schools. In 1954 this was more than $27,000. 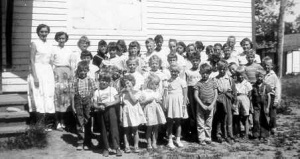 The growth of the summer Bible school program (Daily Vacation Bible School) continued in the Mennonite Church (MC) until 1963. In that year there were 835 schools, 11,033 teachers, and 100,786 students. In 1973 there were 744 schools, 7,567 teachers, and 77,256 students. The 1983 records reveal a decline to 599 schools, 6,053 teachers, and 54,210 students. The trend from ten-day material to five-day material went from 95 percent for ten-day in 1954 to only 25 percent in 1985. The enrollment continued to drop even though less time was spent in summer Bible school. Alternative approaches have been introduced. For example, weekend summer Bible School beginning Sunday afternoon and concluding Monday evening for grades six through ten. Team teaching (usually husband-wife teams) was used for the first time in Scottdale to present the Herald Omnibus Bible curricula. Box lunches were provided by the congregations for Sunday evening. Monday's lunch was served by the women of the church with a hot dog and watermelon cookout in the evening meal. Devotionals consisted of campfire programs each evening. On the denominational level, Paul Clemens succeeded C. F. Yake as secretary for the summer Bible school program from 1958 through 1963. Maynard W. Shetler served from 1964 through 1967. In 1968 the Commission for Christian Education assumed responsibility for the summer Bible school program. Since 1975 the Mennonite Board of Congregational Ministries has given leadership to the summer Bible school program. The Herald summer Bible school materials and program were made available in India in Hindi and in Europe in German and French, with a few grades translated into Italian. The Herald Summer Bible School Series was revised in 1958 and again in 1966/67. In 1976/77 the course was rewritten, built mostly on the same Bible texts. A five-day, closely-graded course was developed from the ten-day curriculum to meet the need for shorter schools. The Herald Omnibus Bible Series was released in 1973 and 1974. Outlines for this closely-graded course were developed by Paul M. Lederach with James E. Horsch as editor and Marjorie Waybill as associate editor. This series explores what the Bible and Jesus have to say about the issues children and youth face. This multipurpose course was designed for use in five-day vacation Bible schools, church camps, released-time Christian education, clubs, and week-day or Sunday evening study. The daily vacation Bible school (Die Sommerbibel Schularbeit in the early reports), was initiated among the Mennonite Brethren in Canada by Bethany and Winkler Bible Schools in 1933. The mission to children, as recalled by Henry Warkentin, awakened unprecedented interest and missionary zeal and became the first organized expression of missionary vision. From small beginnings that engendered much enthusiasm in the 1930s and the 1940s daily vacation Bible schools (DVBS) peaked for the Mennonite Brethren between 1957 and 1965. The big question raised about DVBS was what happened to the converts? How many churches developed from this work? John Dyck stated in 1966 that after nearly 25 years of children's work, they had not established one permanent mission. The first summer Bible school among General Conference Mennonites was held in the summer of 1921, at Berne, IN. Affiliation with the Summer Bible School Association at Chester, PA, was effected and their prescribed course for a five-week term was adopted. In 1925, the four churches of Berne united to make it a union summer Bible school. Cornelius H. Suckau served as superintendent of the union summer Bible school from 1931 to 1940. From the 1930s onward, daily vacation Bible schools were common throughout the General Conference Church. A wide variety of interdenominational materials were used, including the Herald Summer Bible School Series. Claassen, Willard. "Reflections on the Development of Christian Education Program and Ministries." Unpublished paper. Lehman, Naomi. Pilgrimage of a Congregation. Berne, IN: First Mennonite Church, 1982. Penner, Peter. No Longer at Arm's Length: Mennonite Brethren Church Planting in Canada, 1883-1983. Winnipeg: Kindred Press, 1987. Available in full electronic text at: https://archive.org/stream/NoLongerAtArmsLengthMBChurchPlantingInCanadaOCRopt?ref=ol#mode/2up. Sprunger, Eva F. The First Hundred Years: a History of the Mennonite Church in Adams Co., Ind., 1838-1938. Berne, 1938: 170. Sprunger, Mary. "Education and Publication: the Early Days." Unpublished paper. Yake, C. F. The Summer Bible School: an Agency for Christian Education, Superintendent's Manual. Scottdale, PA: Mennonite Publishing House, 1951. Yake, C. F. Superintendent Manual, Summer Bible School (1951), has been reissued three tunes (1958, 1966, 1978). Yake, Clayton F. and Maynard W. Shetler. "Summer Bible School." Global Anabaptist Mennonite Encyclopedia Online. 1989. Web. 26 Apr 2019. http://gameo.org/index.php?title=Summer_Bible_School&oldid=163625. Yake, Clayton F. and Maynard W. Shetler. (1989). Summer Bible School. Global Anabaptist Mennonite Encyclopedia Online. Retrieved 26 April 2019, from http://gameo.org/index.php?title=Summer_Bible_School&oldid=163625. Adapted by permission of Herald Press, Harrisonburg, Virginia, from Mennonite Encyclopedia, Vol. 4, pp. 654-656; vol. 5, pp. 864-865. All rights reserved. This page was last modified on 11 March 2019, at 02:14.